Credit unions have a special opportunity to breathe new life into the brand affinity that has existed with their members for so many years. Historically this kinship (or affinity) developed organically based on a shared commitment to help members of a common employer or trade organization prosper. In the past “the Credit Union Way” was easier to define because the business model was much simpler. Today credit union members are less homogeneous. Competition is more intense. As a result, what it means to be a credit union is less obvious to both employees and members. Credit Unions remain committed to those principles that help their members prosper – we call it the “credit union way”. The “Credit Union Way” is still driven by serving the best interests of members and is the basis for strong brand affinity. The “Credit Union Way” is real. It is the organic quality that differentiates credit unions from every other financial institution. Today credit unions are facing a valuable opportunity to leverage what it means to be a credit union and grow at the expense of other financial institutions. Consumers are placing a very high value on trust with their financial institution. Credit unions have what consumers are looking for. Research we have conducted for credit union clients clearly points out that consumers unequivocally associate the credit union ethos (“the Credit Union Way”) with enduring trust. Consumers are knocking on the door and the question is, will credit unions answer it or remain closed to the opportunity of leveraging their natural strengths? Re-igniting the “Credit Union Way” inside a credit union will fuel the growth of brand affinity with members. The process starts with credit union employees understanding and finding alignment with the “Credit Union Way.” Below is a practical process our firm has implemented in a number of credit unions to build strong brand affinity with employees on the inside – the basis for building brand affinity with members in the marketplace. Define Your “Credit Union’s Way.” Every credit union will benefit from clearly defining its own, authentic version of the “Credit Union Way.” At the core of every credit union’s brand (its “Credit Union Way”) is the powerful ethos of what it means to be a credit union, based upon the affinity it has for its members. Starting with that ethos a credit union can define its unique brand platform that clearly defines the their “Credit Union Way” in practical terms easily understood by all employees. Therefore it is more important than ever for a credit union to define its proprietary version of the “Credit Union Way.Defining a proprietary “Credit Union Way” starts with building from the common characteristics that are shared by all credit unions. The real ethos of a credit union is its unshakable commitment to its members. At their core, credit unions believe in their members and have a mutual stake in their success. This commitment and respect is the core ethos of the “Credit Union Way.”Some credit unions will choose to emphasize certain elements of the “Credit Union Way” as a way to differentiate themselves from other financial institutions. Some credit unions choose to differentiate themselves on lower interest rates, while others may focus on a high touch service strategy. The next step is to use a simple brand platform framework to translate a credit union’s customized version of the “Credit Union Way” into a practical set of behavioral descriptions so that every employee can apply the intent of the credit union way to his or her job. An example of a strong brand platform for a financial institution can be found in this case study. Help Your Employees Define Their Personal Brands. The strongest form of internal alignment occurs when employees believe their personal values are in-sync with their employer. Our experience is very clear that the majority of employees have not taken the time or had the opportunity to define their values. This is an area of personal and professional development many companies overlook. This is an organizational development opportunity for credit unions. The other reason to help employees define their personal brands is that as service-based business, the personal brands of employees have a huge impact on how members perceive their relationships with a credit union. Using a business-oriented framework of personal brand will help employees translate their personal values into a set of authentic behaviors when serving members. 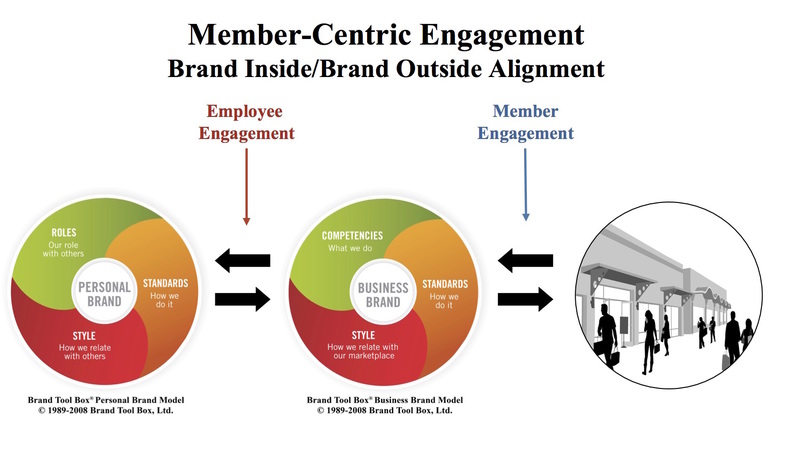 A business-based approach to personal brand is a proven tool to enhance customer (member) relationship-building skills. This process has proven to create strong, sustainable internal brand affinity that is the foundation for lasting brand affinity with members. Give it a try.